mixture is a true azeotrope, with constant vapor and liquid composition at its boiling point. This fluid is ideal for medium-duty cleaning and degreasing tasks, as well as specialty solvent applications, and is intended to replace ozone-depleting materials in many applications. 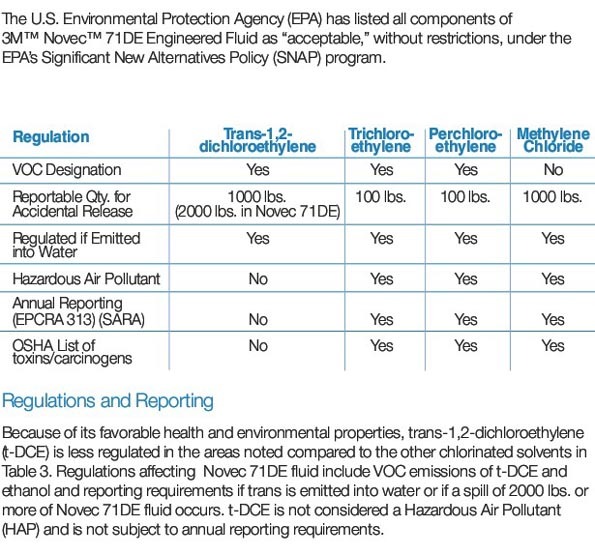 It has zero ozone depletion potential and other favorable environmental properties (see Table 2). Novec 71DE fluid has a time-weighted average exposure guideline of 750 ppm (eight hour average) for the3M Novec 7100 Engineered Fluid component, and 200 ppm (eight hour average) for trans-1,2-dichloroethylene (t-DCE). These exposure guidelines suggest there is a large margin of safety for use of Novec 71DE fluid in its intended cleaning applications. The increased solvency and low surface tension, nonflammability and constant composition during boiling of Novec 71DE fluid make it ideal for immersion and vapor degreasing applications. These properties also may make the azeotrope ideal for certain coating and lubricant deposition applications where increased solvency is required.